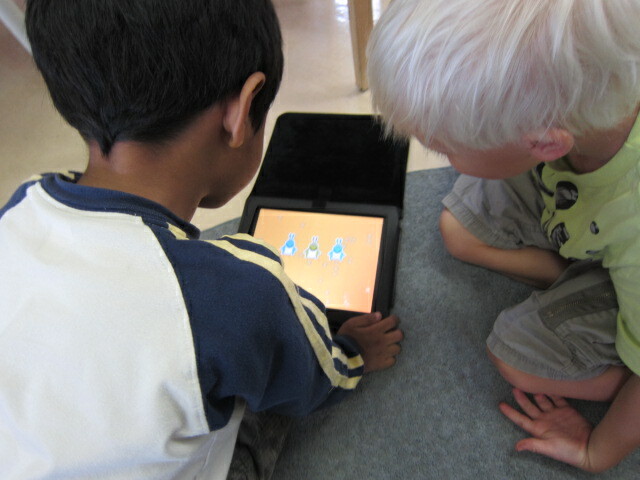 The use of technology in our Kindergarten classrooms reflects the increasing use of technology in our every-day lives. Technology is incorporated into all areas of the curriculum, as a tool to support teaching and learning. There is a place for digital games to help children practice skills. However, most of the time the children are using laptops, iPads, and digital cameras to help them express their thoughts and ideas, access information and document and share their learning journeys. Over the course of the year, the children will have opportunities to explore off-line and web-based tools. Through the class blog, children will begin to develop and understanding of the concept of a “digital foot-print” and the power of digital communication. Throughout the year, we discuss ways of using the internet safely and responsibly. The school has invested in 15 new iPads to share between Kindergarten and Grade 1 classes. I thought about how I would introduce the children to the new iPads. I was a bit unsure as I had never used an iPad or iPhone before. 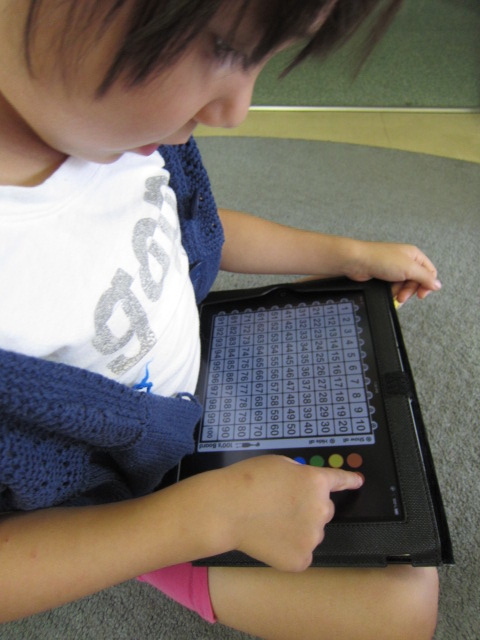 I decided to start by finding out what the children already new about iPads. I predicted that they would be far more knowledgeable than me. Aika Oh, I know those. My dad has one at home. I do games. Lisa Yeah, my dad too. Aika You can do games. I know. But not Wii. Different. Lisa I can do on iPhone. I have iPod and iPhone and iPad. Eileen My mum and Dad never buy. They say no, no, no. Saku My dad have and I always do game. But my sister have DS. Saku I have two; my mama have one and my dad. Aika I know iPod. Its for music. Jenny It has lots of buttons, and a big round twirly thing. Issey My daddy does have computer same. With apple. Saku My daddy have but no apple. Issey Somebody eat that apple. Look! Jenny Oh yeah, He’s right! It’s got a big bite. Issey No. It’s iPad don’t have apple. At this stage I intervene, and explain that the apple is the logo for the Apple Company, which produces several different types of devices. Together we brainstorm and come up with a list of Apple devices, which I write on a sheet of butchers’ paper. We read the list through together and I leave the butchers’ paper hanging on the easel for the children to revisit throughout the day. The next day, we look again at the paper recording the children’s ideas. The children remark on the repetition of i and we talked about the apple brand. Saku suggests we make a table. (We have used tables in the past for recording all kinds of information.) I ask what information we should record in the table. “I know! We can write if you have any. Like who has a iPad.”, suggests Jenny. The rest of the group agrees and so I create a table, wondering out loud as I draw, about how many rows and columns I will need. The children draw tallies on the appropriate cells to record their prior experiences with these appliances. It is becoming clear that that the children have had a great deal of prior knowledge and experience. I decide to handout the iPads without much background information, and to observe what the children do with them. The children pick up the iPads and get to work. They are purposeful and confident. Many children know how to turn them on. Even first time users quickly discover how to scroll through screens and select apps. The children spend the next 30 minutes absolutely absorbed in their personal inquiries. They are all deeply focused on what they are doing. At the end of the session, I feel I am dragging them away to send them outside to play. I introduce the children to the word application and invite them to explore some of the applications on the iPads. The children were to work in pairs. Before they start, I asked them to discuss with their partners how they can make sure that both partners have equal opportunities to work the iPads. The children agree strategies with their partners and get to work. I tell them that I will be asking them to share their thoughts about the apps they have used at the end of the session. The students spend several sessions exploring on their own, helping each other out and swapping favourite apps. At the end of the session I ask the children to share their thoughts about the apps they worked with. I ask the children how we will record their ideas. Someone suggests a list; someone else thinks a table will be better. In the end, we decided to make a table. Talking Tom Because he funny and fall down and he have stars. It’s boring. Only falling down. And he’s not doing anything. Only the same thing every time. Jack and the beanstalk story It’s so funny. The egg is the best because you have to find where it is. Cat in the Hat It’s Dr Seuss and he so funny, that cat. And I can read it by my self. Simple Symon You have to copy but its so hard. And you can get better every time. It’s too hard. Even if I do it again and again, I can’t do it. Feed Me It’s so easy. You can do it every time. Toy Story It’s so, so good. It’s funny. Align Four It’s good because you can play with your friend. We were about to start a new unit on sharing the planet. For this unit, we planned to work closely with the Japanese department, looking at the some of the space issues in Japan. Together with the Japanese teachers, we planned that the children would make 3D models of Japan to help them understand the limited building space. We planned that we would refer to 2D maps and to a globe to help the children understand the geographical location of Japan. We wondered whether Google earth might provide a good opportunity to integrate iPods into our unit of inquiry. Wd decided to introduce the children to the Google earth application, without much front loading and to record their responses. Again, the children worked in pairs. Adults were on hand to support and encourage the children if needed, but really, we wanted to see what the children came up with oh their own. I find a snow place. It’s white, that why. I have a place like ice. So much, much ice. Maybe the North pole? No, that’s not Yokohama. No houses. Yokohama has too many houses. Hey, it’s going big and small. And now its bigger and bigger and bigger. I can make it turn. Look, it’s spinning round and round. It’s like the real earth. No, the real earth don’t spin like that. Yes, it says Japan. Look! The children were fascinated with the application and spent ages exploring how to make the Google earth globe turn and spin. They loved zooming in and out, and shrieked with delight, calling out to each other. Some children began to get frustrated because they couldn’t control the zoom function, and couldn’t keep track of where on the globe they were. However with adult support, they remained engages and fascinated as they discovered streets, parks, sports fields and other landmarks. Several children made connections between the app and our classroom globes. A possible next step is to display maps of the world, Japan and Yokohama so that the children can continue to make connections between the different ways of representing the planet. Each month we focus on a new author. We had planned to look at the books of Eric Carle for this month. However, when we realized that several of the iPad apps featured books by Dr Seuss, we decided to make a last minute switch to Dr Seuss. The children gathered a collection of Dr Seuss books from the library. The children were already familiar with some of the Seuss classics, which were in our class library, and could “read” the books by themselves. They were able to identify the Seuss apps on the iPad easily and were soon making connections between the printed books and the digital books.